In a telephonic conversation with Restaurant India, Ramnidhi Wasan, CEO, Rocketchefs talks about creating first 'Food Truck on Call' model. While the world of food start-ups seems to be crashing down in India, shouldn’t this be a cause for deterring new ones sprouting in different corners? Definitely not! Learning from the mistakes of contemporaries and fitting in proper systems revenue and cost effectiveness, the next module of food start-ups will be through food trucks! 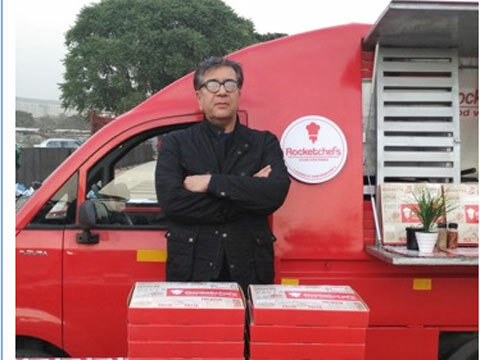 Yes, understanding the need to be mobile, cost effective and time saving for the consumer, Rocketchefs - the world’s first food trucks on call, sets up its first service in Gurgaon. The model is based on India’s legendary street food scene, and Rocketchefs expands the variety of food available as “street foods”, taking it to the next level by providing them completely on demand. Led by industry experts, Rocketchefs aims to use its food knowledge, hospitality expertise, backend support and a strong technological backbone to offer a cutting edge experience to its customers. Ramnidhi Wasan (CEO – Rocketchefs) would be able to take you through his journey. Rocketchefs is the new food truck on call around Gurgaon which works on a model same as Ola. The solution which starts with a mobile app; shows the location, where you can enter the food you want to order and it will help in getting it delivered to you from the vehicles around your location. The moving restaurant is a new take on customers’ choice. You chose what you want and it is sent to you. Are all the vehicles owned by you or have you partnered with any aggregator? All the vehicles are our private vehicles. We haven’t partnered with any vehicle to sell our food. What is your take in building a technology led business? Our focus is entirely around building technology. We are investing a huge amount in technology, its scalability focusing on the social entrepreneurship of the business. How new is this concept for a market like India? No food truck is mobile till now. They all park at certain locations, but we are a bit different from them. We work on call, as soon as the customer orders something from us, the vehicle located in that area delivers the food. It is call-on demand vehicle. How many vehicles are presently with you and how does the target look like? We have 6 vehicles and 5 are under production. What all types of cuisines are there at Rocketchefs? We are offering Korma kebab, pizzas at present and will soon launch korma sandwich, Korma coffee. How the supply chain works? We have a daily supply chain process - we go to the local markets and handpick the freshest ingredient on our own. We want to saturate Gurgaon first and then come to Delhi. In 90 days we are trying to have 25 vehicles with us to expand our reach in other parts of Gurgaon. Is there any delivery time to process the order? We don’t have any delivery commitment yet. Commitment is towards the quality of food. Do you see this model as business? At present, there are 14 members in our team. We want to be a social start-up by entering into a franchise model. We will provide the brand, customer acquisition, supply of food, the backend, to the partner franchisee with focus on regional franchisees. What is your plan targeting the residential areas around Gurgaon? We are poised to enter about 25 per cent of the residential areas in next three months. About Us: A Nibs is the centre of the Cocoa bean..
An EASIER Way of Enhancing Decision Making..
Igniting Success Via Fitness Franchising.. The Wellness Tourism Market in India..
9 Zero Real Estate Cost Business Ideas..
Foodport to enter Delhi, Noida early 2016..
7 Wellness Trends To Watch Out For.. Rising demand for Edutainment Franchises..
Why It’s Time to Invest in QSR Brands..